All the transformers are basically isolation transformers as they provide electrical isolation between primary circuit and secondary circuit. But most of them either step up or step down the voltage level and produce corresponding change in the current level. Note : The transformer which are particularly designed to provide electrical isolation between primary and secondary circuits, without change in voltage and current level are called isolation transformers. Obviously the turns ratio such isolation transformers is 1: 1 i.e. N1 = N2, V1 = V2 and I1 = I2. Hence, isolation transformers are also called 1 : 1 transformers. Due to isolation transformer, the secondary i.e. load side is physically and electrically isolated from the primary side i.e. supply side. 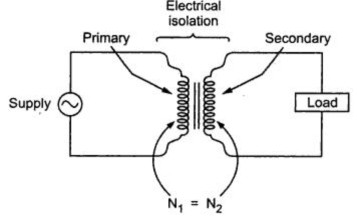 There is no electrical connection between the primary and the secondary. This is shown in the Fig. 1. The two windings are magnetically coupled with each other. As primary and secondary voltage as well as current is same, such 1 : 1 transformers are used for the purpose of electrical isolation only. The main function of isolation transformer is to reduce the voltage spike before it reaches to the load. 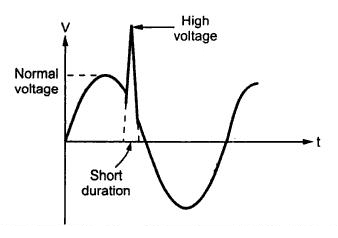 The voltage spike is sudden increase in the voltage which lasts for very short duration of time, as shown in the Fig.2. 1. Interruption in service to load. 2. Loss of data if the load requirements are machines like computers. 3. A damage to the equipments. 4. Audio and video signal distortions. 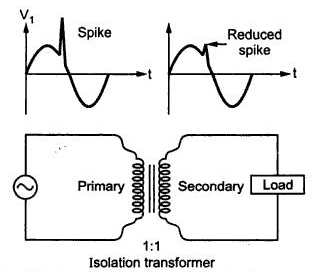 When such a voltage spike gets applied to the primary of the isolation transformer, the current through an inductive primary winding can not change instantaneously. It tries to change exponentially. As current increases, increasing flux gets linked with the conductors to induce voltage in them, which opposes the cause i.e. spike producing them, according to Lenz's law. Thus faster the current tries to change, greater is the opposition. The spike is very fast change in voltage and current and hence opposition is also higher to such spikes. Note : By the time spike reaches to the secondary, due to the opposition, it gets eliminated or reduces greatly so as to avoid any undesirable effect due to it. This is shown in the Fig.3. Another important function of an isolation transformer is to remove the equipment on load side from ground. Sometimes it is necessary to disconnect the equipment from the ground to avoid accidents. Similarly grounding can cause ground loop interference and noise. 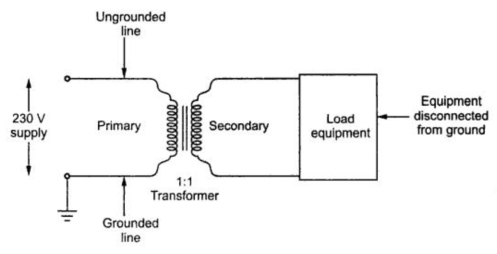 To avoid these effects the secondary load side can be disconnected from the ground, using isolation transformer as shown in the Fig. 4. Note : Thus isolation transformers are often installed to isolate and protect the sensitive as well as expensive equipments from noisy electrical system grounds, ground loop interference, voltage spikes and other power line distortions. The basic construction of isolation transformer is similar to a core type transformer with same number of turns on primary and secondary. It consists of the filtering as well as protective circuits. Nice Article.Thanks for sharing information about Isolation transformer.Power Engineers provide Constant Voltage Transformer And Stabilizer in india.